Chocolate is the ultimate comfort food: we reach for it in times of stress, it improves our mood when the going gets rough, and it is downright delicious under any circumstances. Amazingly, after years of getting a bad rap, as unhealthy and high in sugar, chocolate is experiencing a renaissance of sorts and research now shows that high-quality chocolate, in moderation, is actually good for us. That’s a win-win situation for the chocoholics among us – which is pretty much everyone, right? In “A Brief History of Chocolate,” the Smithsonian Institute Magazine interviews Alexander Leaf, who runs Chocolate Tours of New York. As Leaf says, chocolate is “the best-known food that nobody knows anything about.” Etymologists trace the origin of the word “chocolate” to the Aztec word “xocoatl,” which was a bitter drink brewed from cacao beans. Today, the term “cacao” is usually used to refer to the plant or its beans before processing, while the term “chocolate” refers to anything that is made from the beans. Chocolate has been around for about 2,000 years, though some experts claim that it may be even older. Recently, anthropologists discovered cacao residue on pottery excavated in Honduras that could date back as far as 1400 B.C.! In pre-modern Latin America, cacao beans were considered so valuable that they were used as currency. And the ancient Mayans and Aztecs believed the cacao bean had magical properties, using it in many rituals related to birth, marriage and death. Sweetened chocolate didn’t appear until Spanish explorers discovered the Americas in the 15th century and sampled the native cuisine. Chocolate didn’t appeal to the newcomers at first, but once they combined it with honey or sugar, it quickly became palatable and popular. By the 1600s, chocolate was a fashionable drink throughout Europe, where it remained a luxury until the advent of mass-production in the late 1700s. In 1828, Dutch chemist Conrad Van Houten found a way to extract the cocoa butter from the bean. He would pulverize what remained and treat the mixture with alkaline salts to cut the bitter taste, creating what became known as Dutch cocoa. 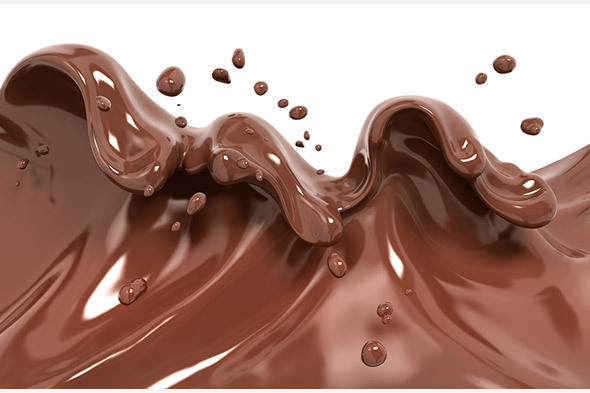 The creation of the first chocolate bar is credited to Joseph Fry, who discovered a way to make a moldable chocolate paste, which could be formed into bars. By1868, a little-known company called Cadbury was using the paste to create boxes of chocolate candies in England. Milk chocolate was launched a little while later by another “small” company: Nestle. In the 20th century, the word “chocolate” expanded to include a range of treats that have more sugar and additives in them than actual cacao. More recently, however, there’s been an increasing interest in high-quality, handmade chocolates and sustainable cacao farming. Major corporations like Hershey’s have expanded their artisanal chocolate lines by purchasing smaller producers known for premium chocolates. Overall, chocolate manufacturing in the 2000s is an industry valued at more than $4 billion in the United States, and the average American eats at least half a pound of chocolate… per month. Why Do We Crave Chocolate? At the most basic level, we crave chocolate because it tastes so good. The great feeling we get when we eat chocolate is the result of our brain releasing chemicals – mainly dopamine – in response to each chocolate experience. Dopamine is released when we experience anything that we enjoy, as the dopamine signal sent through our body brings about positive feelings in the frontal lobe of our brain. 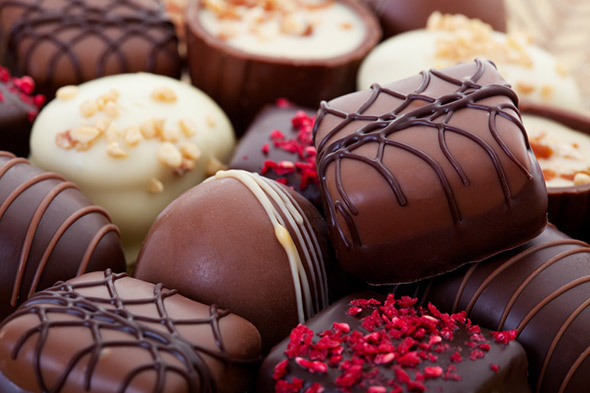 In addition, chocolate contains theobromine that can increase our heart rate and bring about feelings of arousal. Another ingredient in chocolate, caffeine, can make us feel awake and increase our ability to work and focus; and, last but not least, fat and sugar, which we humans like because they are calorie dense and give us energy. Chocolate begins with the cacao tree, which grows just north and south of the equator and thrives in a mix of hot temperatures, rain, and shade. Every tree yields oval pods, which contain 30–50 seeds each, and these seeds are what the world knows as cacao (or cocoa) beans. Technically, the tree, pods, and seeds should be referred to as “cacao,” while the word “cocoa” is reserved for the bean after it has been fermented, dried, and roasted. Ripened cacao pods are typically harvested twice a year. After harvesting, the pods are opened, and the beans are removed, cleaned, and then fermented: they are covered with banana leaves and start to take on the color and some of the flavors of the chocolate we know and love. After fermentation, the beans are dried under the sun for a week or two and then graded, packed into sacks, checked for quality, and shipped. Once received by the manufacturer, the beans are roasted at low temperatures to develop flavor. The meat of the bean – called the nib – is ground into cocoa mass, which is solid at room temperature and, under high pressure, yields cocoa powder and cocoa butter. Cocoa mass can also be combined with more cocoa butter and sweetener to make the chocolate we eat. Dark chocolate requires only cocoa mass, cocoa butter, and sugar, and adding milk powder to the mix makes milk chocolate. White chocolate is made with cocoa butter, sugar, and milk powder, but no cocoa mass (which is why some people do not consider it a true chocolate). Conching is the process of rolling, kneading, heating, and aerating the cocoa mass, and it is a critical step in producing pure and delicious gourmet chocolate. The longer a chocolate is conched, the smoother it will be. Once the conching stage is complete, the chocolate is slowly brought to a certain temperature (88° F to 91° F) to “temper” it, and the cocoa butter reaches a stable form that gives it its shiny surface and smoothness. At this point is it ready to be delivered to the chocolate maker. Is Chocolate Healthy? You Bet! 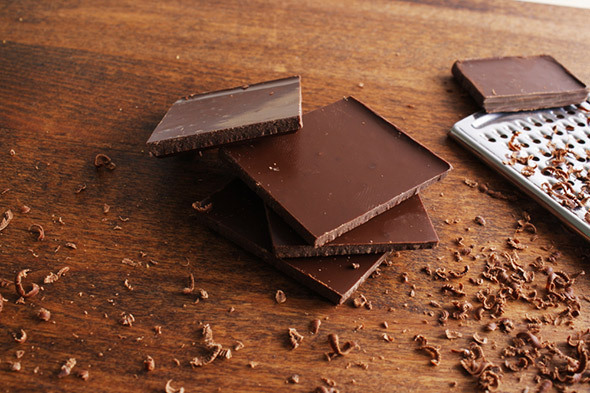 Dark chocolate is loaded with nutrients that can positively affect our health. 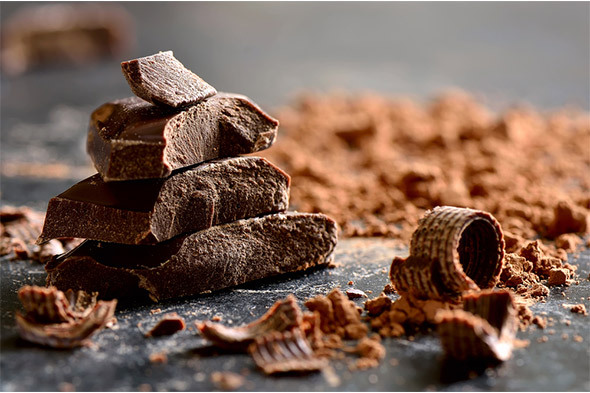 It is one of the best sources of antioxidants on the planet, which means that dark chocolate (not the overly sugary kind) can improve our health and lower the risk of heart disease. Studies have shown that cocoa and dark chocolate have more antioxidant activity, polyphenols, and flavanols than any fruit, including blueberries and acai berries. Dark chocolate with a high cocoa content contains soluble fiber and is packed with minerals, such as potassium, phosphorus, zinc and selenium. A 100-gram (3 oz.) bar of chocolate also comes with about 600 calories and a fair amount of sugar. However, the fats in chocolate are mostly saturated and monounsaturated, with small amounts of polyunsaturated fat. To get the full benefit of chocolate, the darker the better, so choose chocolate with 70% or higher cocoa content. In an age when chefs are preparing their own meat products (charcuterie), when craft brewers are growing their own grains, and when baristas can tell you which farmer grew the coffee beans that went into the coffee you’re drinking, a growing number of people are trying to master the art of making chocolate from bean to bar. Like wine and coffee, cacao beans are affected by the soil and the environment in which they are grown, and while chocolate’s flavor depends on everything from fermentation to conching, the type of bean matters too. The most common cacao categories are Forastero, a full-bodied species that stems from West Africa; Criollo, the predominate beans in Spain, which have a mild bitterness and acidity but are expensive and vulnerable to disease; and Trinitario, a hybrid of Criollo and Forastero, which is hardier and less fruity than Criollo beans, but less bitter than Forastero. Crafting chocolate is both an art and a science, and it requires carefully controlled conditions during each step of the process. Nevertheless, hand-crafted chocolate can be found more easily than ever today, and many artisanal chocolate makers from California to New York have launched bean-to-bar operations. Because this specialty chocolate is never mass produced, each batch of bars is different. This process jacks up the price, but today’s chocolate aficionados firmly believe that the artisanal bean-to-bar method is the only way to truly experience chocolate. The trend is so catchy that Megan Giller, author of Bean-to-Bar Chocolate: America’s Craft Chocolate Revolution, has posted a list of the top 50 bean-to-bar chocolate makers in the United States – and they all sound marvelous. Whether you are seeking a complicated recipe or a simple garnish, such as a dusted plate or shavings on top of a pie, the applications for chocolate are seemingly endless. Inspired cooks are branching out and moving beyond chocolate-dipped strawberries and brownies to incorporate cocoa into everything from salads to chili. Chocolate allows us to expand our palate because it has so many complex flavor notes and therefore so many effects on our taste buds. Chocolate, of course, can be velvety and sweet in desserts; but it can also be intense and bitter for savory dishes, as seen in the “12 Savory Chocolate Recipes,” offered on the Saveur website. The key to getting the most out of chocolate is recognizing that cocoa has endless possibilities, and that its potential, despite what you may think, has gone largely unexplored. This entry was posted in Cooking Tips, Food Guides, Marketing and tagged chocolate, cocoa beans, homemade. Bookmark the permalink.